Cuba had been on my travel wish list for a long time. Every time I visited the Yucatán, I thought about hopping on a flight to Havana from Cancun, but somehow it never happened. The restrictions for Americans to travel to Cuba played a big role in this during my first two visits to Mexico in 2010 and 2012, but in 2017, the timing was finally right. I found a $100 flight deal from Cancun to Havana, and thanks to the ease of travel restrictions for Americans along with new flight routes from the U.S., my friend was able to fly directly from New York to Cuba. (Side note: The joy was short-lived. After Trump’s new restrictions, I am glad that we went to Cuba this year. If you are a US citizen, read this NYT article to find out how you can visit Cuba under the revised Cuba policies). Even though getting to Cuba from North America has become easier, the country itself is not particularly easy to travel in. I did a lot of research before my trip to make sure I knew what I’d be getting myself into, and that I would be able to prepare accordingly, from dealing with two currencies to arranging transportation around the country in a place where I couldn’t just hop into a rental car like I’d done in Mexico a couple of weeks prior. Of course, despite detailed research, it was impossible to find out everything I needed to know, and some things I learned as I traveled the country (the fact that there are more tourists than available seats in public buses, for example!). 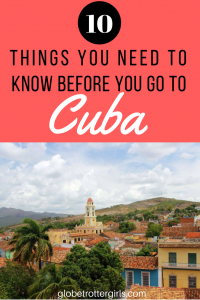 To help make sure your trip goes as smoothly as possible, I wanted to share with you the ten things I think you need to know before traveling to Cuba. There are some hotels in Cuba (with more rapidly being built right now), but most of the accommodation in Cuba consists of casa particulares, or ‘home stays’. These are basically apartments or rooms within somebody’s home – just like Airbnb – but casa particulares have been around much longer. Until recently, you couldn’t book these casa particulares online, but since 2015, Cubans have been allowed to list their homes on Airbnb, which makes it much easier to book a place to stay before you travel to Cuba (most international booking websites don’t list Cuban hotels). You can still travel like people used to – arrive in Havana, walk around looking for a casa particular, and then have your hosts refer another casa in your next destination – but I much preferred knowing where I’d be staying before I got there. Not only was it easy to book, but it also meant we needed to bring less cash with us, since our accommodation was paid for through the Airbnb website. Arriving in Havana without anything booked in advance seems as daunting to me as it’d be to arrive in New York City without a place to stay, and during our visit, most casas were fully booked. The girls we shared a cab with on our way to Viñales had tried to book something in advance, and their host in Havana had called a bunch of casas for them without success. I don’t need this extra level of stress while traveling, which is why I’ll definitely book via Airbnb again when I return to Cuba. (Side note: If you don’t have an Airbnb account yet, sign up through my referral link and get up to $40 off your first booking). As for the hotel vs homestay aspect, I have to say that staying in casas particulares added so much to our trip – interacting with locals and seeing how Cubans live, instead of staying in a boring hotel. The casas were decorated with personal items, and our hosts were always keen to cook us a home-cooked meal which was often cheaper than a restaurant meal. But even if you feel more comfortable staying in a hotel, be warned: in some towns, there aren’t any hotels. In Viñales for example, we only saw a couple of large hotel resorts far outside of town. In Viñales itself every accommodation was a homestay, and I wouldn’t have wanted to stay too far away from the action. Hostels are almost non-existent in Cuba, which is why solo travel can be a bit solitary. There are a few hostels in Havana though, so if you’re looking to meet travel buddies, I’d recommend staying in a hostel when you arrive in Cuba to be able to meet other travelers to team up with. 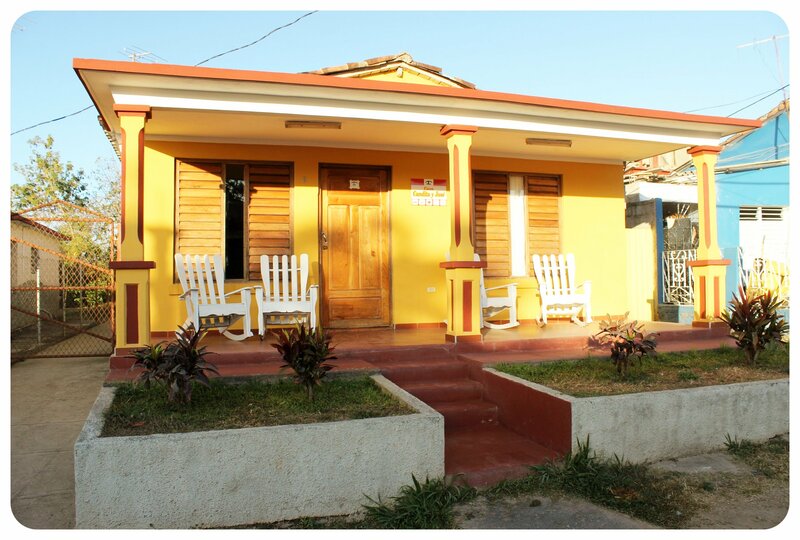 Outside of Havana, the only other hostel in Cuba currently listed on Hostelworld is in Camaguey. Getting around Cuba is not as straightforward as it is in Mexico and other Latin American countries, where you can just show up at a bus station and hop on a bus (or book a bus for the same day). If you are traveling by bus, you always have to book your tickets at least one day in advance. Taxis offer a little more flexibility. Rental cars are also not as straightforward to book as they are in other countries. Online reservations are often not acknowledged, and all car rental agencies are state-run, like almost all of Cuba’s tourism businesses. Because the government owns them, car rental agencies aren’t really open to negotiation – expect to pay a day rate of US$45- 55, depending on the car and season you’re visiting in. If you do decide to book a rental car, be aware that on top of the daily rate you’ll have to pay insurance, and gas isn’t cheap. In total, a rental can add up to around US$90 per day, so you may want to evaluate if it is really worth it for you. During busy times, it is common for travelers arriving at the airport only to find that no rental cars are available – so make sure to plan for this eventuality. 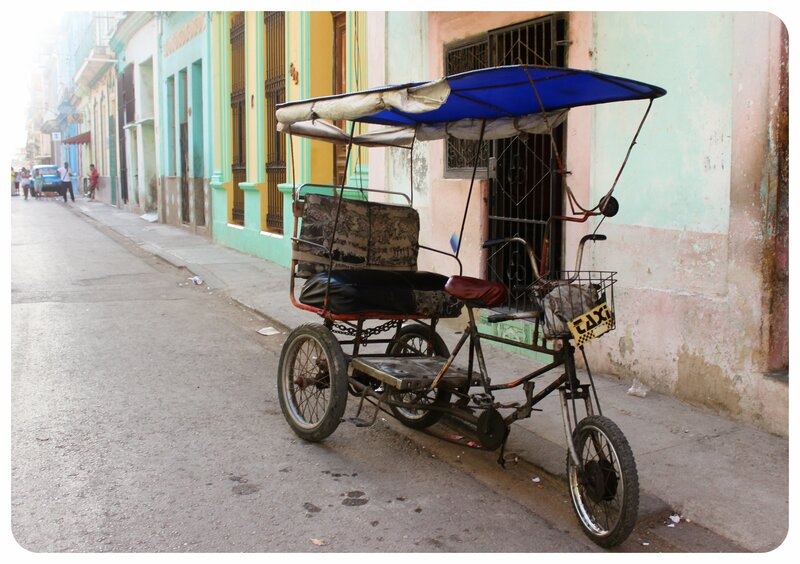 In Havana you can easily walk within the Old Town, but if you’re staying outside of the Old Town like I did on my first visit, you might want to take taxis or bicycle taxis, which will cost you between CUC5 – 10. Make sure to always negotiate a price BEFORE getting into the cab. 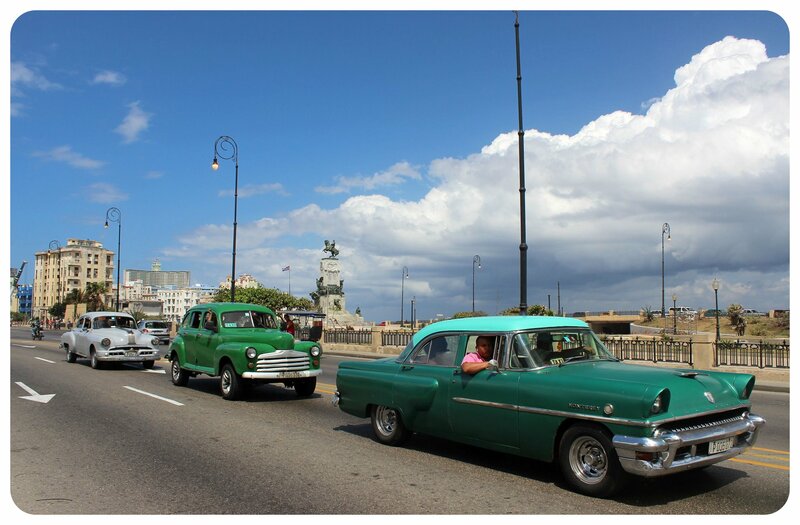 In Havana you can also take a fancy vintage car cab ride for around CUC20 – 30 an hour, or a tourist hop on hop off bus for CUC10. Our first choice would have been the Viazul buses, which cater to tourists, i.e. they are a bit nicer but also more expensive than the local buses. However, that plan didn’t work out at all. Before flying to Cuba, I registered online to book all of our buses in advance – and they were all fully booked already! Visiting during Semana Santa meant that it was much busier than usual as many Europeans take extended Easter vacations and there were also quite a few Americans around, especially in Havana, but I heard that the buses are often sold out, not only during the high season and Holidays. After a fruitless search for an alternative way to get to Viñales, our next stop, the lady who ran our casa particular told us our best chance would be to go to the Viazul bus station where we’d probably find other travelers to team up with and share a taxi. She also asked the taxi driver who brought us there to help us, and we found a shared cab with two other girls pretty much the minute we got there. We paid $20 per person, which is only $8 more than the bus, and it was much more comfortable traveling in a vintage Cadillac with a wide back bench for the two of us. We ended up using shared cabs for all of our trips because they were only a few dollars more expensive than the bus and they saved us a couple of hours traveling time on each trip. 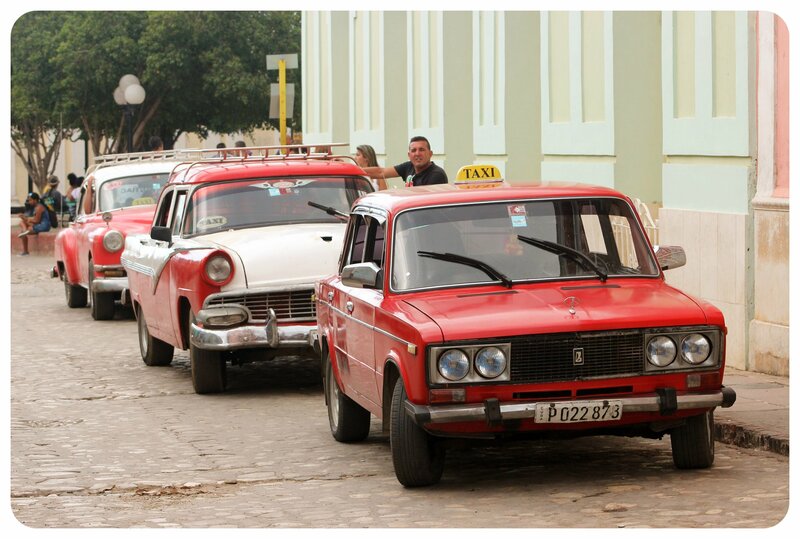 But they weren’t always comfortable – our longest ride from Viñales to Trinidad (7 hours) in an old Russian Moskvitch was painfully cramped. If you’re not on a tight budget, you can hire the entire cab, which is a bit pricier but will make your travel days much more comfortable. 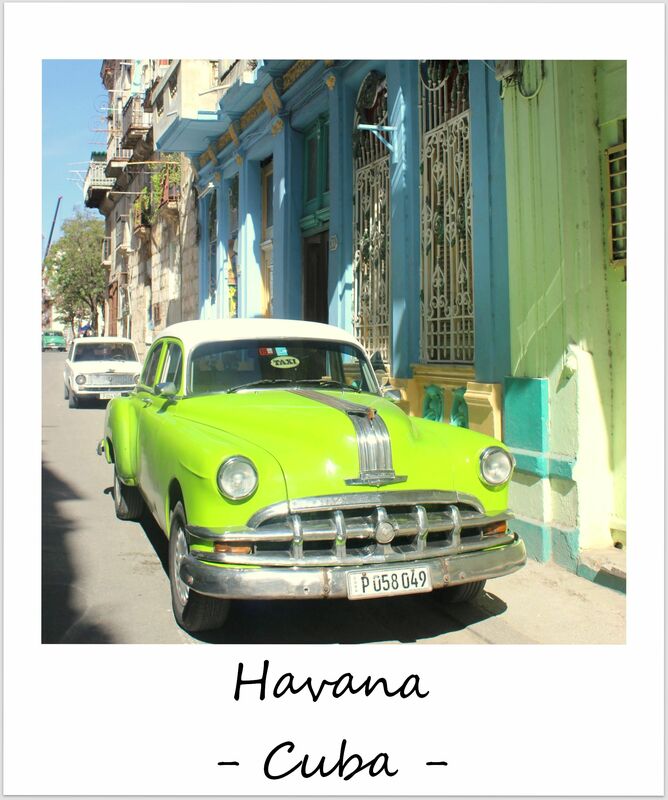 The price is US$120 from Havana – Trinidad, and US$100 from Havana – Viñales. We occasionally saw bigger (newer) shared taxis on the road but I am not sure what they charge. The fact that there are two Cuban currencies was initially very confusing for me. In short, the Cuban Peso is worth so little that the Cuban government introduced a second currency just for tourists. To make things more confusing, this currency is also called ‘Peso’ – but ‘Convertible Peso’, or CUC for short. One CUC equals 25 CUP, and I highly recommend exchanging a few dollars into CUP (which isn’t officially encouraged by the Cuban government, but you will always find a helpful local to exchange CUC to CUP for you) so that you can take advantage of the super cheap CUP prices at street food stalls and fruit vendors. Changing five CUC to CUP will give you 125 CUP which will go a long way. As for how much to budget for a trip to Cuba, I’ll be sharing what I spent on my trip in a separate article, but I recommend budgeting around US$50 per day. When it comes to exchanging money, I’ve got bad news for you, and even worse news if you’re an American, because Cubans don’t like US Dollars. 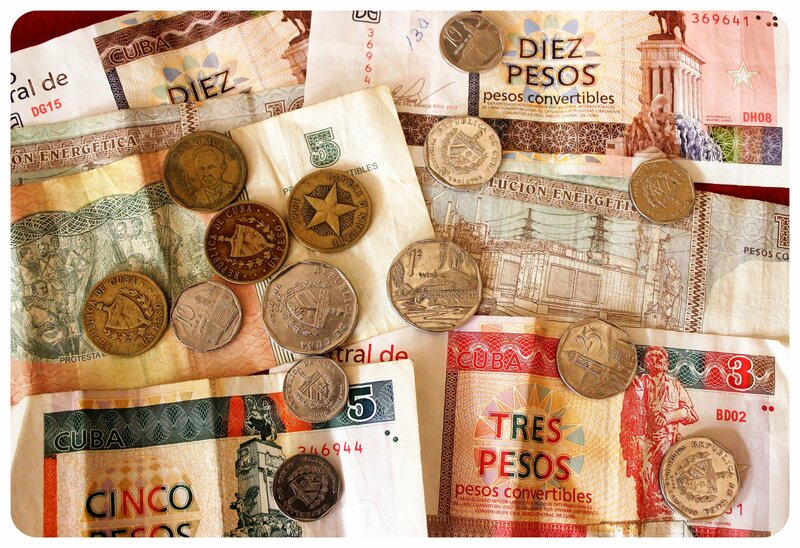 No matter where you’re hailing from, try NOT to visit Cuba with US dollars, but with another currency. 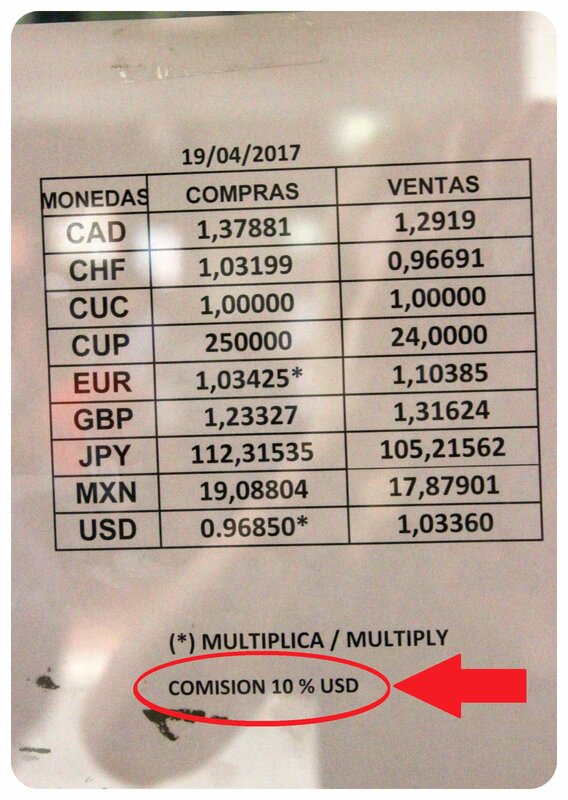 Most banks in the US exchange dollars up to a certain amount for free – my friend was able to change $1,000 into Euros for a nominal fee compared to the 10% fee that the Cuban government imposes on any Cuban Peso – US Dollar exchange. 10% may not seem a lot, but if you’re exchanging $1,000 into CUC, that’s $100! This fee is not imposed on other currencies. 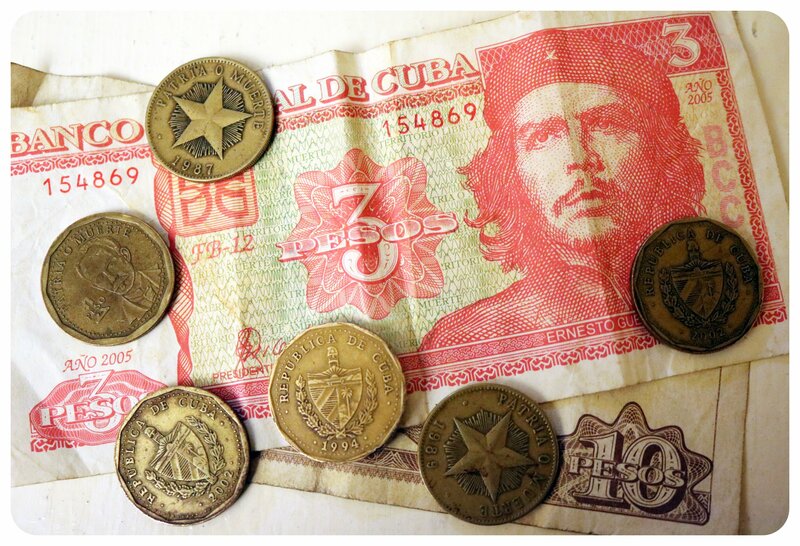 As you may guess, you can’t get Cuban Pesos anywhere outside of Cuba, which means you’ll have to exchange money upon arrival. There are two money exchange booths at the airport (directly outside of the terminal), and these booths get so busy that you easily end up spending an hour in line. There is a way around that though – at least if you are not American. American cards aren’t accepted by the few ATMs that there are around Cuba, but bank cards from Europe, Canada and the rest of the world work without any problems. I was lucky enough to have my British ATM card on me and so I just walked up to the ATM to take out some CUC while everybody else had to wait in the long lines at the money exchange. I’d recommend looking up the exchange rate between CUC and the currency you’re planning on bringing, just so you have an idea of how many CUCs your cash will buy you. The XE currency converter does list Cuban Convertible Pesos. As for using credit cards – only fancy hotels (and now probably also the newly opened luxury mall in Havana) accept credit cards – don’t expect to use credit cards anywhere else, including casas particulares. It’s a bit of a hassle to calculate how much you may spend, and I recommend adding at least another €100 to that as a safety cushion. Wi-Fi is sparse and can be difficult to find. If you don’t have a phone that works overseas (Americans, note: T-Mobile hasn’t included Cuba in their 140+ countries list of free roaming at low speeds, and I am not sure what other providers charge per MB – you might want to check before your trip) and if you’re not planning on staying in fancy hotels in Cuba: Don’t plan on spending much time – if any – online. Everyone is allowed to buy up to three cards at the same time, so if you want to save yourself some time, buy three at once. If you don’t use the entire time in one sitting, you can disconnect from the ETECSA Wi-Fi and continue to use it later on – after you first activate the code, they are valid for 30 days. 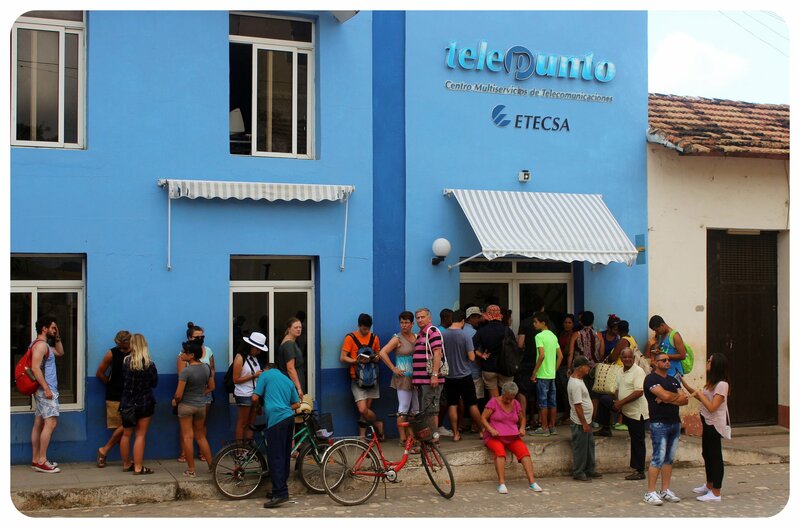 The Etecsa offices usually have a huge crowd of internet addicts lined up in front of them – both Cubans and tourists – and I was so put off by the lines that I ended up not even bothering trying to get online for the entirety of my trip. In some places, there are Cubans outside the Etecsa offices selling the cards to tourists for a dollar or two more – if you don’t mind paying extra, you can save the standing-in-line time that way. But be warned – once you connect to the internet in one of the Wi-Fi hotspots (often public parks/town squares) the Wi-Fi speeds are often atrociously slow. In Trinidad a guy told me he was so frustrated by the slow loading speed of websites and apps that he wished he hadn’t bought a card. Also note that if you are using Outlook, you won’t be able to send emails, since SMTP server for clients are not supported. When you travel to Cuba, you are required to have travel insurance – a rule introduced by the Cuban government in 2010. Proof of insurance isn’t always checked, but it depends entirely on the airline how strictly this is enforced, i.e. checked at the gate. 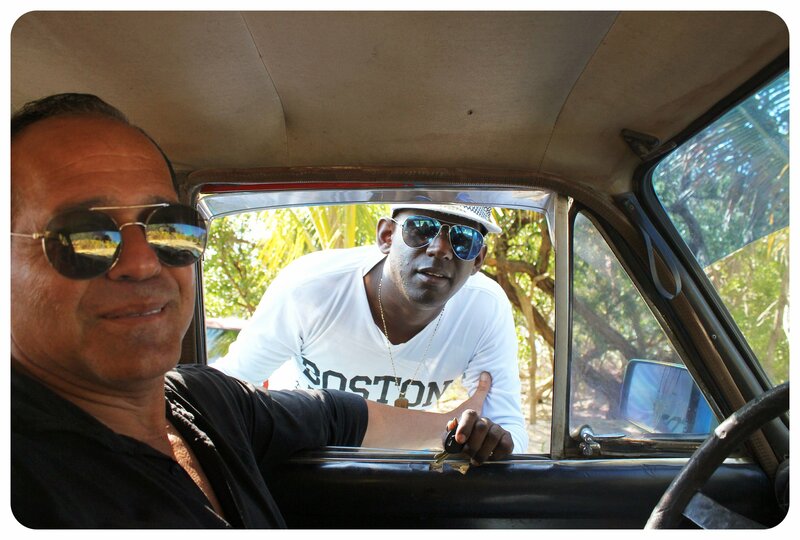 Apparently sometimes Cuban immigration officials also want to see your insurance policy. I ended up buying the insurance offered by Delta during the booking process when I booked my friend’s flight (this insurance also includes flight cancellations & delays) and I myself was covered under the WorldNomads travel insurance that I always use (Get a quote here). If you are buying travel insurance in your home country, double check if Cuba is covered by them. WorldNomads has an informative article about the exact travel insurance requirements. Let’s be frank here: Cuban food does not have a great reputation. But still, I didn’t think it was possible to have so much mediocre .. or even BAD food as we had in Cuba. 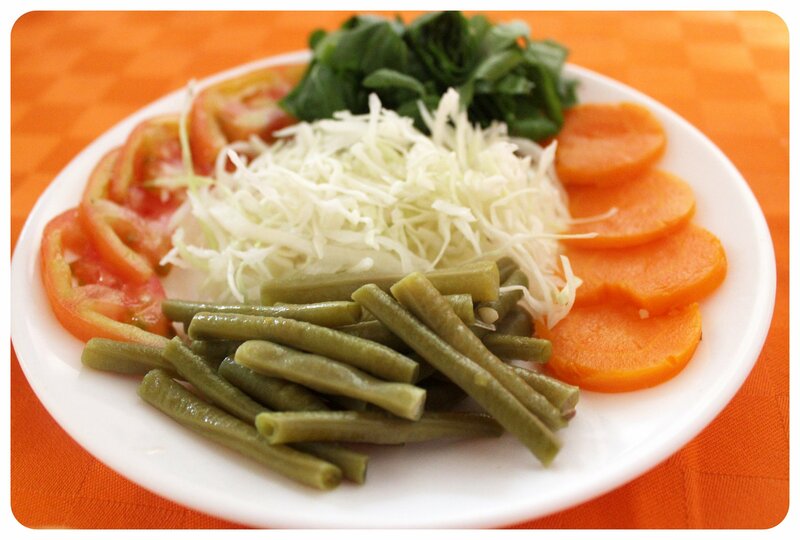 Vegetarianism is a concept that is almost unheard of in Cuba, and I ended up eating a lot of boring, tasteless cheese pizza, and salads were a rarity on most menus (at least outside of Havana). I was happy that I had brought hot sauce from Mexico to spice up everything I ate. Outside of Havana’s Old Town, I saw very few actual restaurants. There are little ‘cafeterias’ in most streets which sell hamburgers, Cuban ‘pizza’ and sandwiches. For actual sit-down restaurants, head down to Old Havana or know the address of the place you’re looking to visit (for example La Guarida is on a random residential street and you wouldn’t just stumble across it if you didn’t know it was there). In touristy places like Viñales or Trinidad there are plenty of restaurants that cater specifically to tourists. 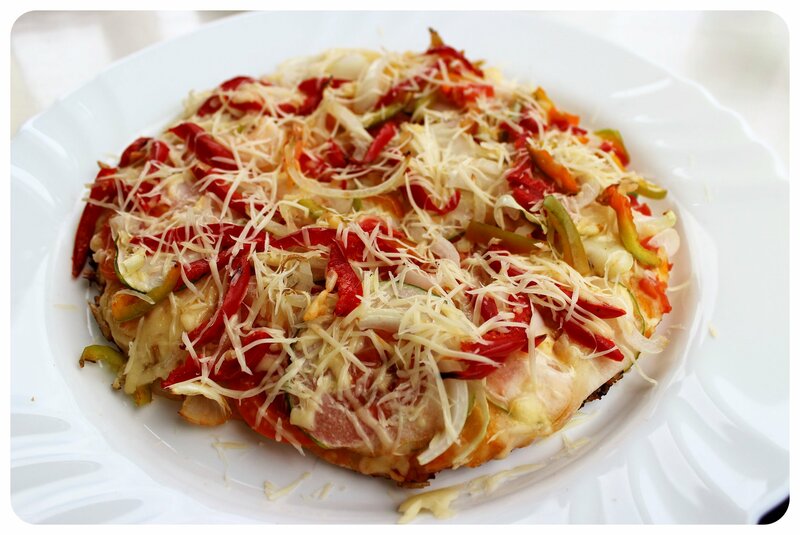 The food is often the same: a few chicken dishes, some seafood, several tapas, spaghetti and pizza. But remember that the quality of pizza and pasta is in no way comparable to the Italian dishes in North America or Europe. One time my vegetarian spaghetti came with some sort of ‘sauce’ that had a distinct taste of ketchup more than anything else, with some eggplant and peppers thrown in. 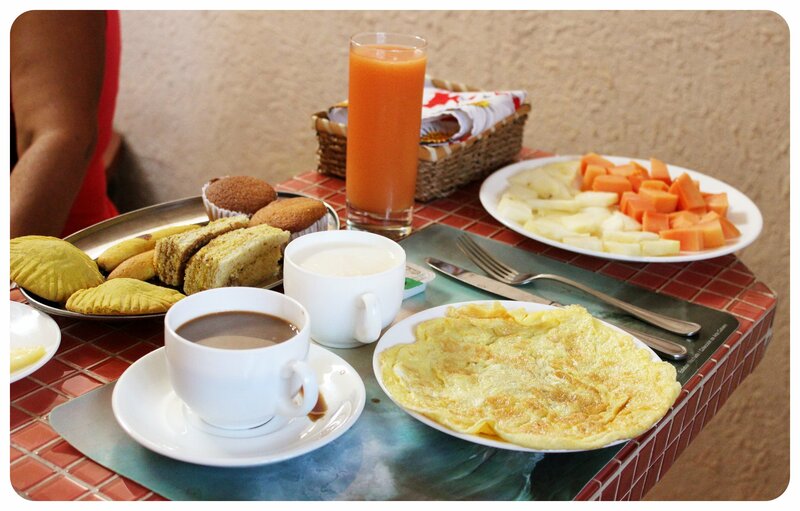 For breakfast, most (if not all) casas particulares offer breakfasts for CUC3 – 5. The first casa particular I stayed in charged CUC5 and the owners weren’t overly friendly, so I headed to another one around the corner for a CUC3 breakfast of an omelette, coffee, mango juice, banana and bread, butter and jam. If you are specific with what you like to snack on and/or want to avoid greasy street food, I recommend you bring your own snacks from home. 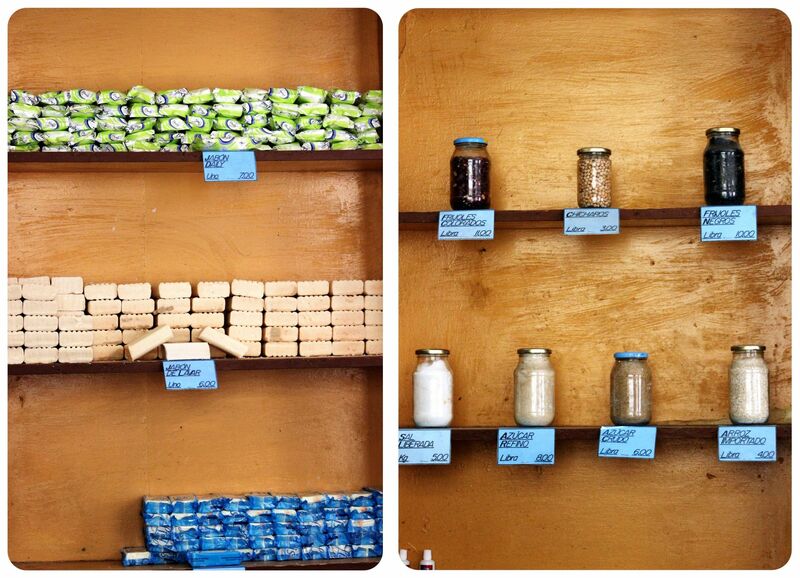 Cuba isn’t a country where you can just pop into a supermarket and pick up some healthy granola bars – the few supermarkets I peeked into had a very slim selection of food, with mostly just basic staples like rice, oil and beans. 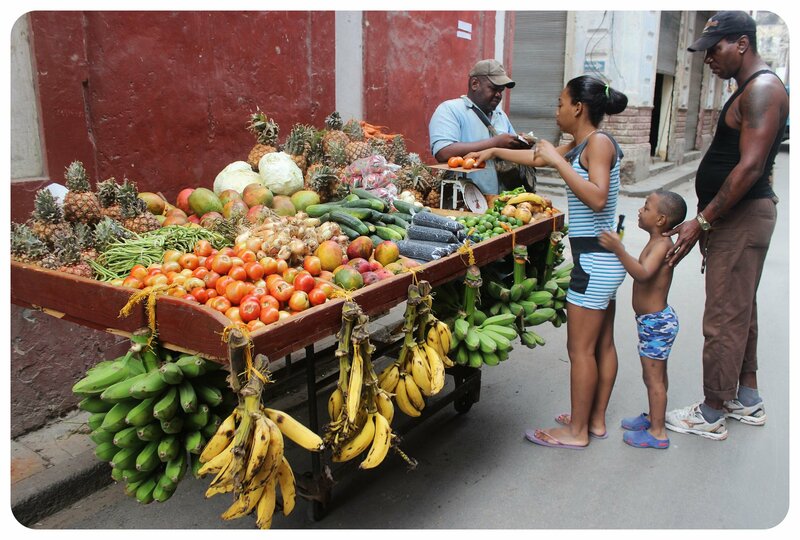 You often see fruit carts on the street where you can pick up bananas and papaya (but don’t say papaya, unless you want them to laugh at you – it’s called fruta bomba here.) There are no apples grown in Cuba and since importing anything is expensive, you will only find fruits or vegetables that are grown in Cuba. If you are planning to buy fresh fruits from local fruit vendors, get some Cuban pesos. On my first day in Havana, it took me a while to find a large bottle of water – there happened to be a shortage of large water bottles while I was visiting. We had to wait until the state-run water company delivered big bottles again, which didn’t happen for several days. I also learned that not all of the little grocery stores sell water, so it’s a good idea to stock up on water whenever you come across it, especially if they are only selling small bottles. Casas particulares and hotels all sell water at an inflated tourist price. In restaurants, you can always get cocktails for very little money – between $2 and $3 for mojitos, Piña Coladas and daiquiris. Beers are between US$1 and $2, depending on the place. Good coffee was hard to come by. 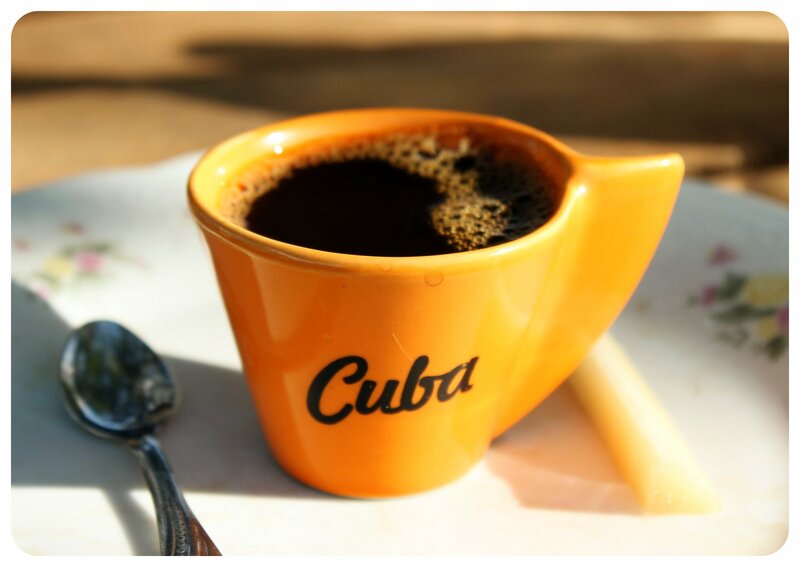 Although Cuba grows some coffee, it’s certainly not known as a country with amazing coffee. If you’re a coffee snob, be prepared to have mediocre to bad coffee while you’re there, or bring your own coffee and a travel aeropress coffee maker. This is only applicable for female travelers, but I thought that it is worth mentioning because I’ve met quite a few female travelers who are very sensitive to cat calling. No matter what you’re wearing and no matter how old you are, you will be cat called. I’ve never been cat called as often as I was in my first 24 hours in Havana, and not only by guys my age, but from men who could by my grandpa through to teenagers. Kissing noises, whistling, compliments like ‘You’re so beautiful’, ‘Linda! !’, ‘Bella!’ – you’ll hear it all day long. I was surprised that even the men who were passing me with their child and a girlfriend/wife on their arm were not shy about cat calling me, or grandpas who sat outside their house with grandma next to them. It seems like if you want to date a Cuban, you have to be pretty liberal when it comes to this sort of thing. 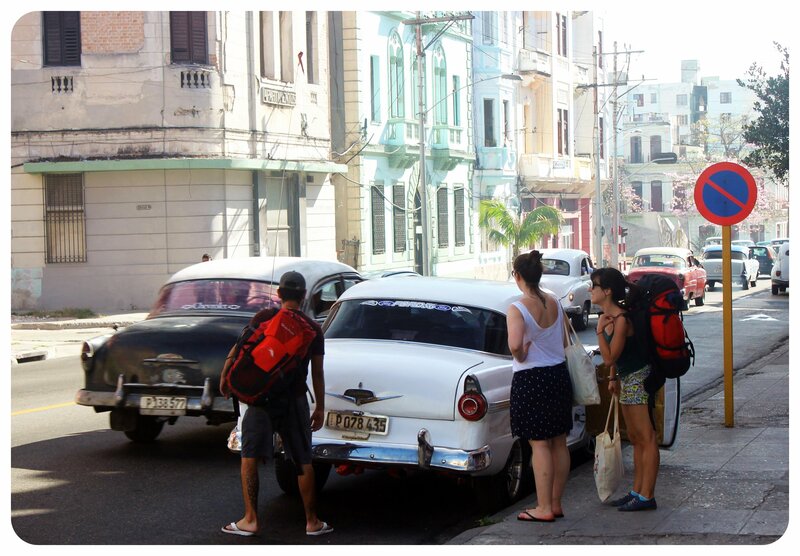 When packing for Cuba, keep in mind that you’ll be traveling in old-fashioned cars with smaller trunks than the ones you’re used to. On one of our rides we shared the cab with a couple who were traveling with two large suitcases in addition to two hard-shell carry-on suitcases and the driver had a hard time storing them and our backpacks all together in the trunk. The woman had to put one of the carry-ons on her lap – not ideal for a four to five hour ride. Some taxis are able to put luggage on the roof, but not all of them. The less you pack, the better. And on the topic of backpack vs. rolling suitcase: you’ll most likely be wandering around cobblestone streets and/or dirt roads, so a backpack could definitely be a better option for traveling in Cuba. And while I recommend packing light, I have to warn against relying on being able to pick up toiletries and other essentials in Cuba. Yes, you can get common things like shampoo and deodorant, but during my entire trip I didn’t see make-up anywhere, or things like tampons and sometimes not even toothpaste. There’s only soap, I never saw shower gel, so if you prefer the latter, make sure to pack it. Things that are needed by tourists but not necessarily by locals, such as adapters, sun screen and mosquito repellent, are better brought from home. 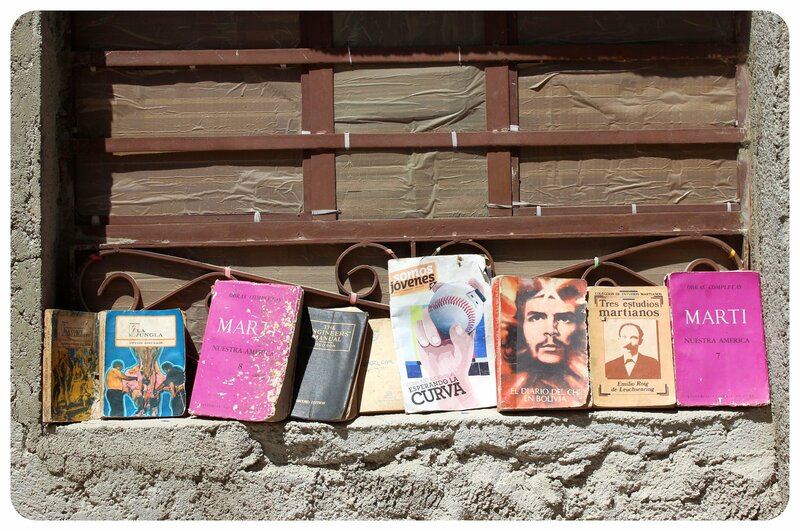 Not only are they pricey in Cuba, but they are also not as readily available as you might think, unless you are staying in a resort in Varadero. A note on adapters: They are hard to come by in Cuba – 90% of the power outlets are two-prong plugs, and not the three-prong plugs that are common in the U.S. and Canada (Europeans need to pack an adapter anyway). If you have any electronics that require a three-prong plug (such as a MacBook charger), make sure to pack an adapter for that. Since you’ll most likely be offline while you are in Cuba, I highly recommend bringing a guide book. I only had the Kindle version of two different guide books with me, and I so wished that I had brought an actual book instead. 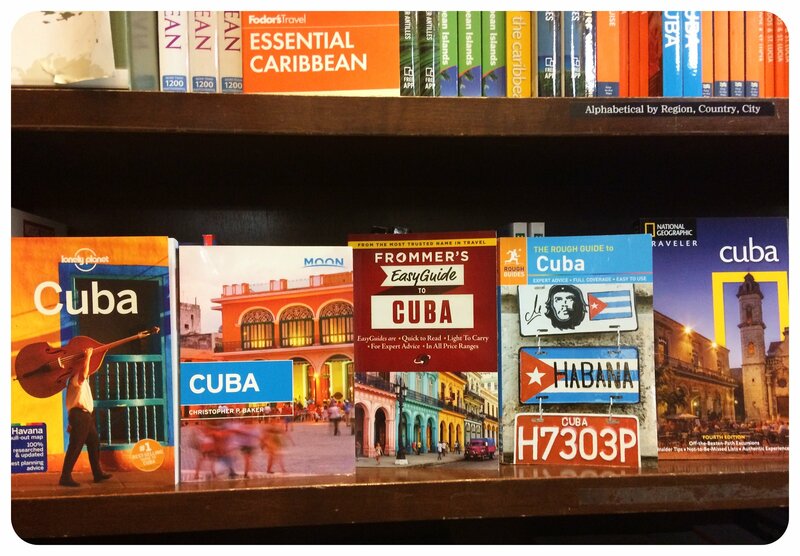 One of the guidebooks didn’t have actual maps inside, but links to GoogleMaps instead (has the author been to Cuba?! What a nonsensical idea), and while the Lonely Planet was great, I would have preferred being able to go back and forth between pages quickly, instead of navigating the e-version of the book. Walking around without a proper map while looking for a certain restaurant or bar was highly frustrating – I’d bring a guide book on my next visit just for that. Even though Cuba is a poor country, I never felt like someone would run up to me and steal my camera or my phone out of my hands, unlike some other countries I’ve visited, where I made sure to stash my electronics away right after using them. That’s not to say you should flash your valuables, but I generally felt safe in Cuba, and was never worried about leaving my belongings in our room at a casa particular (homestay), even though they don’t have safety deposit boxes. If you are planning on staying in casas particulares but feel uneasy about leaving a stash of cash and your passport unlocked in your room, make sure to pack a padlock (that’s what I did), and lock your valuables in one of your bags whenever you leave the room. I’ve never heard of anyone getting pick-pocketed or robbed in Cuba, but that doesn’t mean I’d suggest carrying all of your credit cards (which you can’t use anywhere anyway) and cash with you while you’re out exploring. I never felt unsafe walking around Havana or another city after dark, and despite the constant cat calls I not once feared that a Cuban would actually harass me. 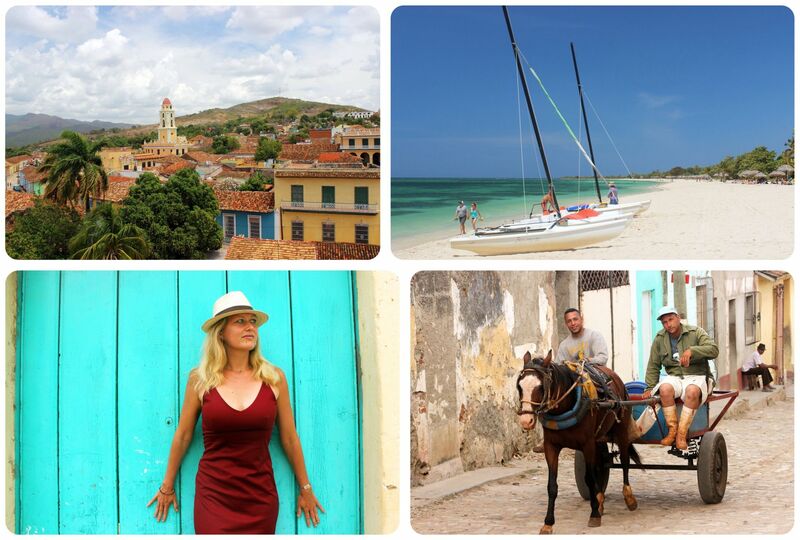 Even though traveling around Cuba was more challenging than traveling in other places I’d return in a heartbeat. It was one of the best trips I’ve taken in a long time, and I am looking forward to sharing more stories from Cuba with you. 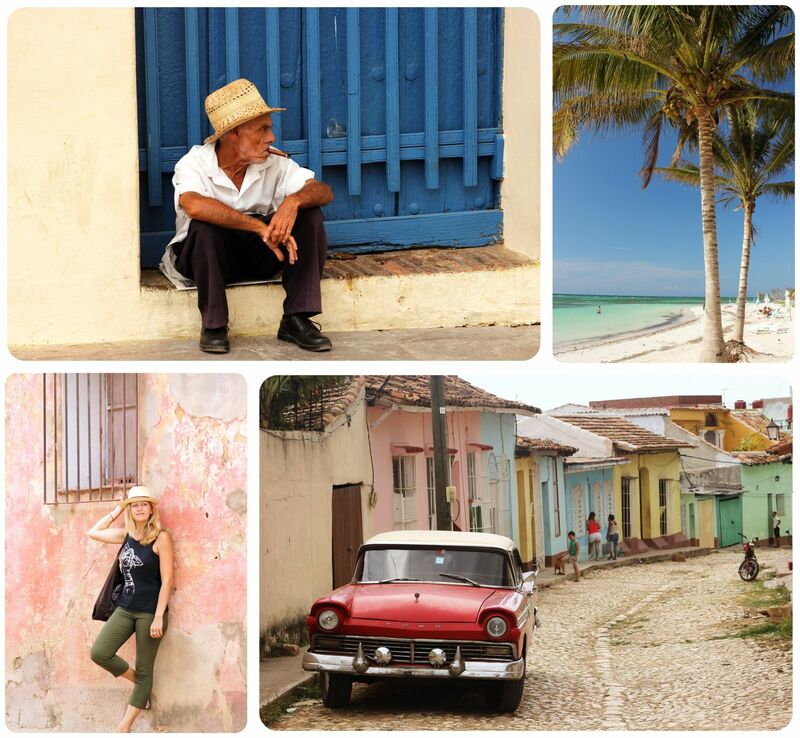 I hope these tips and observations help you make your own trip to Cuba just as memorable as mine was – and please feel free to ask any questions you may still have in the comments below. The true showstopper in Cuba for me wasn’t Havana, but Trinidad, a city founded by the Spanish that dates back to 1514 and is now a UNESCO World Heritage Site. I wasn’t sure if it’d be worth the long drive to get there – the city is located pretty much in the middle of the island, halfway between Havana in the north and Santiago in the far south; around 6 hours on a bus from Havana. But I am so glad that we decided to add it to our itinerary, despite the distance from Havana and Viñales, our first two stops. 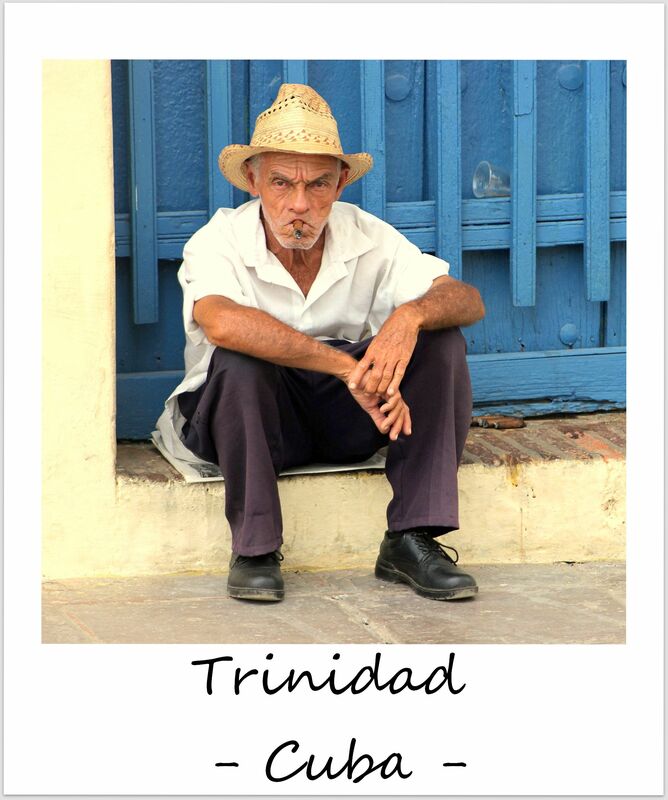 Trinidad looked like it hadn’t changed much since the Spanish founded it in the 16th century – colonial houses line cobblestone streets, there are several Spanish-colonial churches and neatly arranged plazas, and horse carts outnumber cars. When people say that a trip to Havana feels like a trip back to the 1950s (because of all the American vintage cars from that time), it’s safe to say that a trip to Trinidad feels like a trip back to the 16th century. 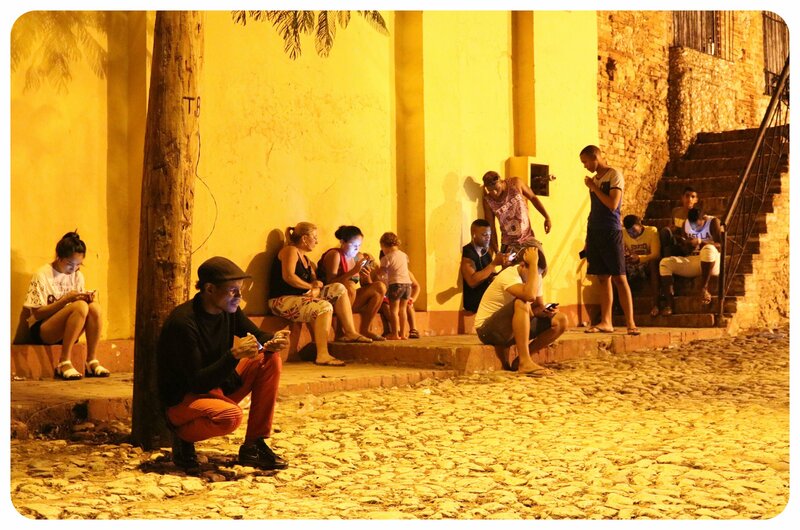 In Trinidad, we got to really soak up Cuban life. With four nights here, we had plenty of time to experience Cuban culture, watch people dance salsa in the town square and in the bars every night, watch locals meet for a chat or a glass of rum in one of the benches that lined all the plazas, and artists draw paintings in the many galleries. 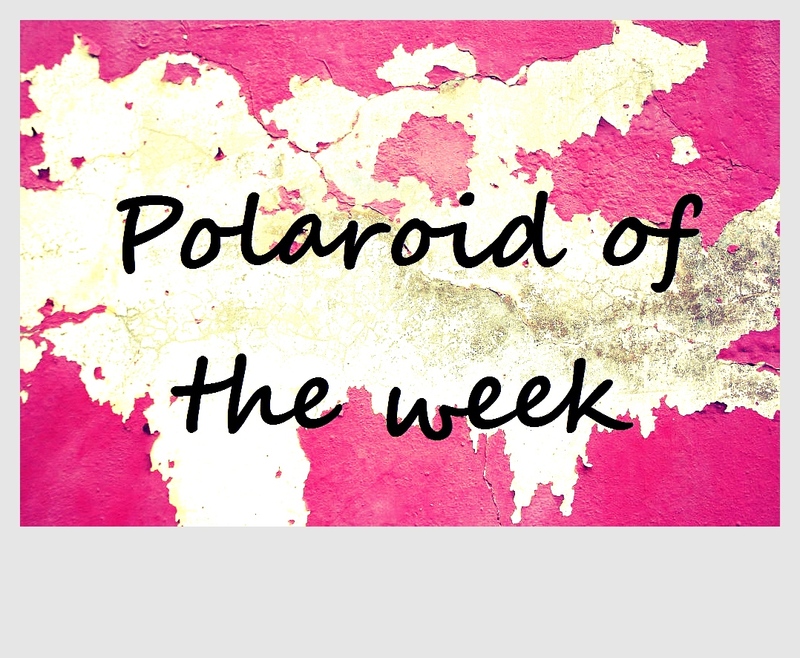 Every time we wandered around town we found a new street that was oozing with character, another crumbling church, another shop that looked more like a museum than a store, with items written on a chalk board and old-fashioned scales on the counter. The rolling hills surrounding the town and the nearby ocean (the popular beach Playa Ancon is only eight miles from Trinidad) only add to the attraction of this picturesque little town. 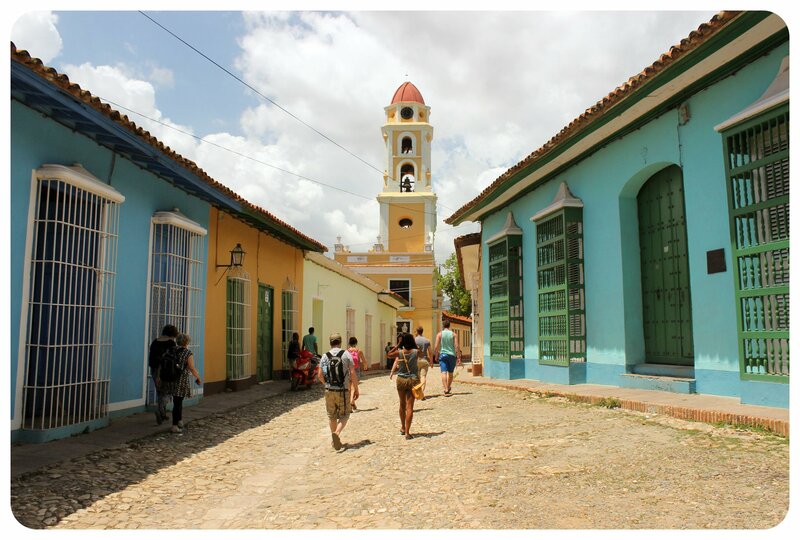 Trust me: Trinidad is not to be missed on a trip to Cuba! Even though Cuba is a Caribbean island, whenever I thought of Cuba, a Caribbean vacation was not what I had in mind. Instead, I pictured Spanish-colonial colorful towns, lush green tobacco fields and the crumbling facades of Havana’s grand buildings. What I wasn’t thinking of were turquoise, crystal clear waters and pristine beaches fringed by palm trees. But of course, there are lots of exactly those in Cuba, and I am glad that I got to include a couple of them into my packed Cuba itinerary. The first beach we went to, Cayo Jutias, happened to be a beach that is one of Cuba’s most stunning beaches (nearby Cayo Levisa on a tiny island off of the coast is supposedly the absolute best beach in Cuba. And yes, every beach we saw afterwards looked just.. uh.. nice.. in comparison (but those were still Caribbean beaches..!). 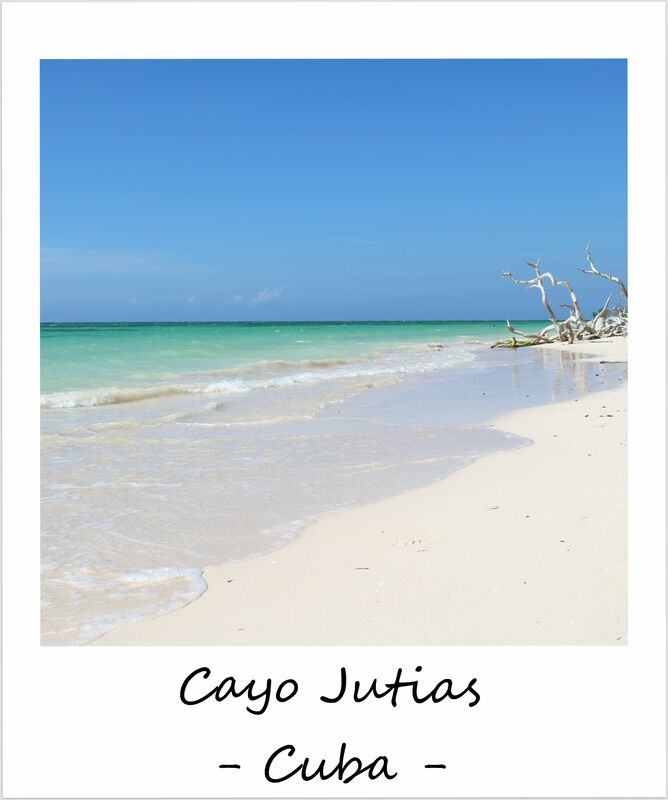 Cayo Jutias doesn’t have any hotels, only a couple of restaurants. Other than that, it is just miles and miles of untouched, picture-perfect beach. And the best thing? Since Cayo Jutias is fairly difficult to get to – located on the northern tip of the island, a bumpy 75-minute ride on a pothole-filled country road from the small town of Viñales – there aren’t many tourists there. I have so many thoughts and emotions about my Cuba trip, I am still processing everything I’ve seen and experienced on this spellbinding little island. Visiting Cuba turned out more challenging as I thought it would be, but it was so worth it. I have yet to go through the thousands of photos I took and sort my thoughts, but I’ll be sharing a number of Cuba articles shortly. 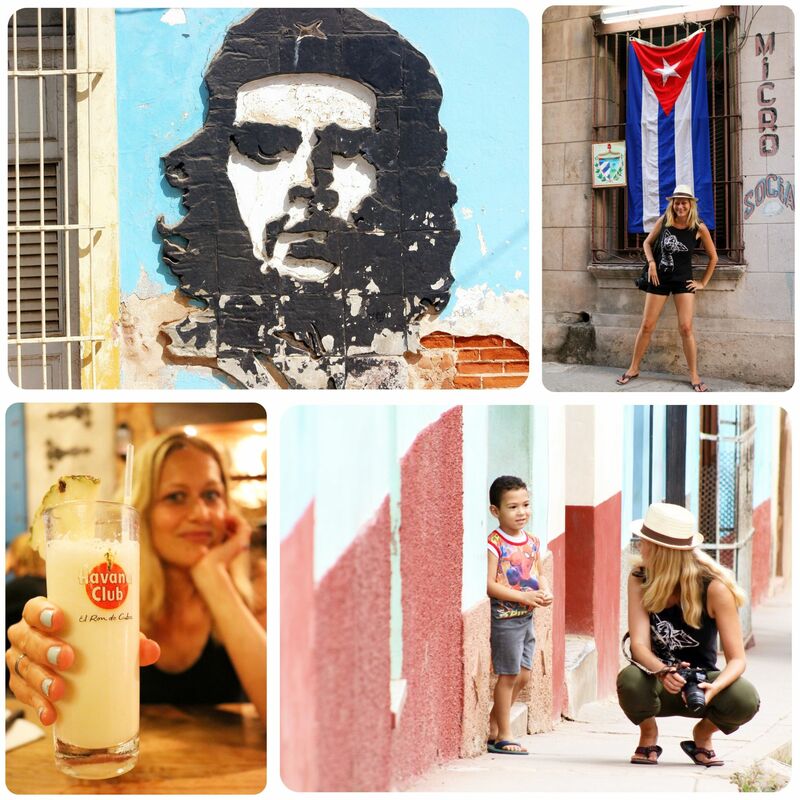 For now, let’s just say that Cuba isn’t like any other country I’ve ever visited, and yet, it felt strangely familiar. Why is that, you wonder? I grew up in East Germany, a Communist country, just like Cuba still is. In fact, Cuba was one of our socialist allies, and while with the collapse of the Communist bloc, life for me and 16 million other East Germans took a huge turn (for the better), Cubans still live so many aspects of the life that I remember from my childhood. Before this little teaser for my upcoming Cuba content becomes too much of a ramble (I’ll be talking about this ‘walk down memory lane’, which this trip inadvertently turned into for me, in an upcoming article) – for now I just want to say that I was fascinated by the spirit of the Cuban people, the lust for life, their ability to find joy in the little things, and about seeing how life spills out into the streets everywhere. I found especially Havana captivating, with its grand buildings, some of which were crumbling while others were already being renovated, showing off a fresh layer of paint and repaired facades, a visible sign of the changes that Cuba is seeing with the ease of the trade embargo of the US. And then there were of course the hundreds of American vintage cars cruising around Havana, just waiting for you to take that classic Cuba shot. I’ve already gotten a bunch of questions about my trip, especially on Snapchat where I’ve been sharing some of the clips I took in Cuba (where I was completely offline, by the way!). Tune in for a Cuba Q&A on Snapchat this Sunday (30 April) – my user name is mariposa2711. How to Break Free in 2013: Our book launch!